Happy New Year! Did you get a Kindle for the holidays? You did – how exciting! Did you know there is an iPhone Kindle app? No? Well, read on. Amazon’s Kindle is just one of many choices in the growing e-book reader category. The Kindle comes in two flavors – the Kindle and the Kindle DX. The Kindle (the one I have) has a six inch display, can hold up to 1500 books, and as of press time retails for $259. Some people have suggested that a six inch display is too small for reading, and that reading on a Kindle doesn’t give you the same feeling of reading that you get with holding a book. After owning my Kindle for seven months, I can tell you that I love the Kindle reading experience. 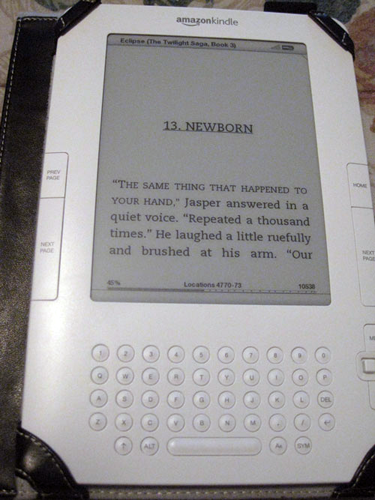 Unlike reading a physical book, the Amazon Kindle allows you to adjust the text size larger or smaller. I wear my reading glasses when I read a book or magazine, but not with the Kindle. Another feature I love is the built-in dictionary. Very helpful when I get to a word I don’t know. In the past I would just continue reading, having no idea what the word meant. Now on the Kindle I can click next to the word and a dictionary definition pops up at the bottom of the screen. Always a good thing to expand one’s vocabulary! Reading the Kindle outside in bright sunlight is not a problem. It uses “E ink” rather than backlighting, so you can sit on the beach, by the pool, or on your deck and read without any concern for the sun. So, now you’re saying, “What does this have to do with the iPhone app?” The Amazon Kindle syncs with the iPhone app. Say you’re waiting for an appointment or you’re out and about and have a few minutes to kill. Your Amazon Kindle is at home. Pull out your iPhone and fire up the Kindle app. 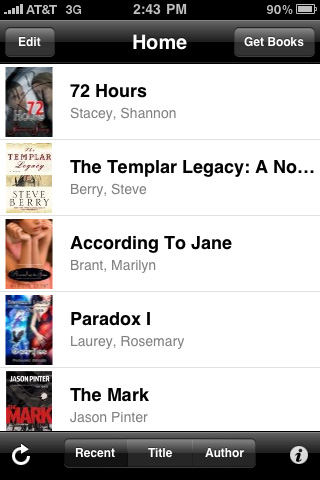 All the books that have been downloaded onto your Kindle will download (if they haven’t already) onto your iPhone. Choose the book you were reading on your Kindle and the Kindle app will sync with your Kindle. One caveat – in my experience, the Kindle app syncs where you started with your last Kindle session, not where you left off. For example, if you read chapters 4, 5, and 6 on your Kindle, and you left off on the first page of chapter 7, the Kindle app will sync to chapter 4. Conversely, the Kindle will sync exactly where you left off on the Kindle app. How is reading on the iPhone? Just like the Amazon Kindle, the Kindle app allows users to change the text size larger or smaller, or change the text color to white on black rather than the standard black on white. Although the screen is smaller, I’ve never encountered any problems or difficulties reading on the iPhone. Turning the page on the Kindle app is as easy as swiping your finger across the screen from right to left, or left to right if you need to go back a few pages. One advantage to reading on the iPhone is that you can read in the dark. The iPhone is backlit, like a computer, so reading at night requires no additional light source. Two months ago I read a few chapters of a book with the Kindle app while traveling at night. I needed something to do in the car, and it was too dark too knit, so reading was the perfect choice. Usually I get a headache and a little carsick if I read in the car – didn’t happen when reading on the iPhone. I don’t know if it’s the size of the phone, the backlighting, or another reason, but I was given back the option to read in the car. Is reading on the Kindle iPhone app as pleasant an experience as reading on the Amazon Kindle? I vote yes. While the Kindle is preferable, it’s not always available when you have a few minutes to read. Plus, many people do not want to spend $259 on the Kindle. The Kindle app is free, and you can buy Kindle books for the app just as you would for the Kindle itself. Reading should be a pleasant experience. With the Amazon Kindle and the iPhone Kindle app it most certainly is.